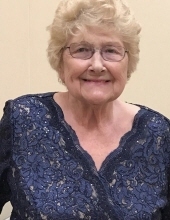 Kathleen A. Kane (nee Kane) of Cherry Hill, NJ, formerly of Philadelphia, PA, died January 15, 2019. Age 81. Beloved wife of the late Gerald L. Kane. Loving mother of Gerald L. Kane (Marie) of Virginia Beach, VA; Patrick Kane (Sandra) of Philadelphia, PA; Kathleen A. Kane of Cherry Hill, NJ; Theresa M. Kane of Cherry Hill, NJ; Jeffrey Kane (Daniel Kinsella) of Royersford, PA; Eileen T. Mullen (Christopher) of Sewell, NJ; Francis X. Kane (Kathleen) of Croydon, PA and Sheila A. Kane of Cherry Hill, NJ. Devoted Mom-mom of Colleen Kane; Gerald L. Kane (Alex Cameron); Kayla Kelly (Michael); Collette Meo (John); Sean P. Kane; Phoebe Mullen (Dave); Brendan J. Kane; Christopher Mullen; Michael J. Herman and Julianne Herman. Great Mom-mom of 1 on the way. Dear sister of Rosemary Banford (Joseph). Dear sister-in-law of Margaret Burke (William) of Chesterfield, MO and Adele Kane (the late John) of RI. Also survived by numerous nieces, nephews, great nieces and great nephews. Viewing Sunday evening 6 to 9pm and Monday morning 10:15 to 11:15am in Holy Eucharist Church, 344 Kresson Road, Cherry Hill, NJ 08034. Mass of Christian Burial Monday 11:30am. Interment private. In lieu of flowers contributions in her memory may be made to the Leukemia and Lymphoma Society, 14 Commerce Drive Suite 301, Cranford, NJ 07016 or to Holy Innocents Parish, 1337 E. Hunting Park Ave. Philadelphia, PA. 19124. To send flowers or a remembrance gift to the family of Kathleen A. Kane, please visit our Tribute Store. "Email Address" would like to share the life celebration of Kathleen A. Kane. Click on the "link" to go to share a favorite memory or leave a condolence message for the family.